No other name represents haute horlogerie like Patek Philippe. This Genevan manufacturer unites luxury, tradition, and high-quality craftsmanship in some of the world's most exquisite watches. Their watches are both status symbols and investments. Patek Philippe are one of the few remaining independent Genevan watch manufacturers. They are still family owned, which contributes to their good reputation — and not just among experts. Patek Philippe build nearly every component for their watches themselves. A Patek Philippe is the crowning piece of any watch collector's collection. What's more, their high esteem and lasting value make these timepieces fantastic investments. This Geneva-based manufacturer offers over 200 unique watch models. Their style tends to be more on the conservative side. While stainless steel models are available, Patek Philippe use platinum and white, yellow, and rose gold more than many other manufacturers. Two of the most famous collections from this storied company are the Calatrava and the Nautilus. The former has been part of the Patek catalog since 1932. This collection draws its inspiration from the simple and linear style of Bauhaus design. Its name comes from the Order of Calatrava, whose cross serves as the company logo. This same image also adorns the crown of each Patek watch. On the other hand, the Nautilus impresses with its sporty and dynamic design. Famous watch designer Gerald Génta designed this watch. Previously, Génta had attracted plenty of attention for designing the Audemars Piguet Royal Oak. Patek Philippe flexes their watchmaking muscles in the Complications and Grand Complications collections. Here you'll find watches with tourbillons, chimes, perpetual calendars, moon phase displays, and world time functions. 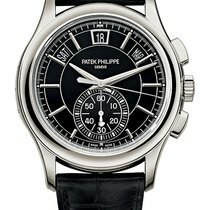 How much do watches from Patek Philippe cost? The Calatrava collection has been part of the Patek Philippe catalog for over 80 years. Thanks to its simple elegance, it is the perfect companion to any tailor-made suit and, thus, the ideal dress watch. There are a number of models to choose from. Models with a small seconds dial at 6 feel particularly elegant. The use of manual calibers also allows these timepieces to stay rather thin. 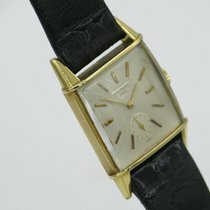 You can purchase a well-maintained watch in yellow gold for as little as 9,800 USD. New pieces range in price from 16,100 to 22,700 USD. You can also get the Calatrava with an automatic movement. Most of these models feature a central second hand and a date at 3 o'clock. Pre-owned models in good condition cost between 19,200 and 25,200 USD. You'll need to invest anywhere from 22,700 to 28,800 USD for a never-worn example. The finest variants of the Calatrava have intricately engraved dials and cases made of platinum. Such timepieces easily demand over 117,000 USD. Patek Philippe show off their sporty side with the Nautilus. Those who value tradition gravitate toward the models in stainless steel—the material used for the very first Nautilus. It was released in 1976 under the reference number 3700/1 and drew immediate attention with its porthole design. Today, these vintage models cost a solid 81,600 USD. Its successor, the ref. 5711/1, changes hands for around 50,100 USD pre-owned. Never-worn examples cost an additional 2,900 USD. However, Patek Philippe not only offers the Nautilus as a three-hand watch, but also with complications, including annual calendars, moon phase indicators, chronographs, and second time zones. Depending on the complication, expect to pay between 45,500 and 104,000 USD for one of these timepieces. The most expensive Nautilus is a 33-mm women's model in white gold. It is encrusted with over 1,700 diamonds and sells for around 218,000 USD new. In 1997, Patek released a watch clearly inspired by the Nautilus — the Aquanaut. That said, it is by no means a replica: Its design is more modern and less angular. The so-called "tropical" strap is made of a special composite material that is resistant to water, abrasion, and UV radiation. Prices for the three-hand version in stainless steel come in at around 29,200 USD. Those in white or rose gold are more expensive at about 35,100 USD. Be prepared to invest another 5,800 USD if you choose a model with a chronograph function or second time zone. Women's models in the Aquanaut collection come with the choice of a quartz or automatic caliber. A 35.6-mm quartz timepiece costs 14,600 USD in stainless steel with diamonds on the bezel. The rose gold version with an automatic caliber sells for around 35,100 USD. Patek Philippe turn watchmaking into an art form in the Complications and Grand Complications collections. Watch enthusiasts are sure to get their money's worth — assuming they have the necessary funds. 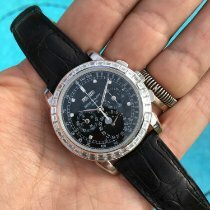 Relatively speaking, models featuring an annual calendar and moon phase indicator are rather affordable, with prices of between 35,000 and 47,000 USD. World time watches, those with a tourbillon, and pieces with finely skeletonized and decorated movements come in at about 93,500 USD. You'll have to dig much deeper into your pockets if you want one of the intricately finished top models with a minute repeater and perpetual calendar. Prices for these masterpieces usually range from 175,000 to 585,000 USD. In addition to the classically round Calatrava and the porthole design of the Nautilus, Patek Philippe also offer a wide array of watches in different shapes. For example, the Golden Ellipse catches the eye with its elliptical design. Crafted according to the divine proportion, it exudes a classic beauty. Current models come in platinum or rose gold and cost around 42,100 USD. However, you can find older models from the 1970s and 80s for as little as 5,300 to 7,000 USD. Patek Philippe had women in mind when creating the Twenty~4 collection. This watch has a rectangular case and bears a slight resemblance to the Cartier Tank thanks to its integrated bracelet and Roman numerals. The Twenty~4 is only available as a quartz watch and comes in stainless steel or rose gold. Plan to spend anywhere from 8,200 to 35,100 USD on this timepiece. The Gondolo collection is marked by its Art Deco design and interesting shapes. Whether it's pillow-shaped, rectangular, barrel-shaped, or a subtle combination of the three, this collection has something for everyone. 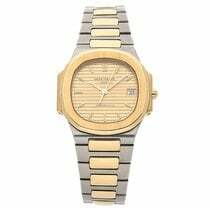 Patek produce these watches exclusively in gold, which is then artfully combined with diamonds and pearls. Most are powered by manual calibers, though some feature a quartz movement. Simpler models cost around 17,000 USD. Prices for more intricate pieces with diamonds and pearls can easily reach up to 170,000 USD. Patek Philippe also feature a few watches with quartz movements. The manufacturer even invented the first so-called solid-state quartz watch with no moving parts and had it patented in 1959. However, Patek Philippe are better known for mechanical watches made with in-house movements. Their calibers have a few special features. In 1949, the company patented the "Gyromax," a special type of balance wheel that is still in use today. While regular balance wheels feature weight adjustment screws on the outside of the rim, the Gyromax has weights set in it. Therefore, it has a greater moment of inertia, resulting in increased precision. Patek Philippe have used the material Silinvar in their escapements since 2005. Similar to silicon, it's anti-magnetic and extremely hard. Due to this hardness, there is less friction in the movement and it doesn't require lubrication. The manufacturer presented the first balance spring made from this high-tech material in 2006. Over the years, Patek Philippe have continued to scale back the number of outsourced movements and components in their watches. In 2005, the company introduced their first in-house chronograph caliber. Since 2012, they have been producing all their chronograph movements themselves. Before that, they had used movements from other manufacturers. For example, the first Nautilus used a caliber based on the 920 by Jaeger-LeCoultre. Audemars Piguet used this movement for the first Royal Oak as well, as did Vacheron Constatin for the 222. Valjoux and Lemania also used to deliver to Patek Philippe. In 2009, Patek Philippe introduced and began using their own seal, which marks a watch passing the world's most demanding quality test for mechanical timepieces. They had previously used the Geneva Seal, which has been a sign of high-quality watches from that canton since 1886. A significant difference between the two is that the new testing methods are for the entire, finished watch. According to the old Geneva Seal rules, separate movements could receive certificates. In 1839, Polish watchmaker and emigrant Antoni Patek (1811-1877) began producing pocket watches in Geneva. There, in 1845, he combined forces with his French colleague Adrien Philippe (1815-1894). Philippe's father had been a watchmaker and taught his son the craft. In 1844, Philippe unveiled an invention to the world of watches that is ubiquitous today: the crown. Before this, movements were usually wound using a key, much like many larger clocks today. 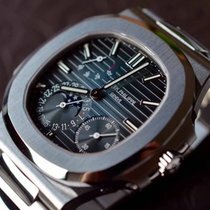 The company has existed under the name Patek Philippe since 1851. The two business partners participated in the Great Exhibition of 1851 in London, where Queen Victoria purchased two watches: one for herself, and one for Prince Albert. Danish and Italian royalty also became members of their distinguished clientele. In addition, a partnership with the New York jeweler Tiffany & Co. began during a trip to the United States when the American retailer ordered 130 watches. In 1902, Patek Philippe patented the first double chronograph and in 1925, they introduced the first wristwatch with a perpetual calendar. In 1932, the Stern family took over the business. Thierry Stern has been leading the company since 2010. Patek Philippe produces around 50,000 watches per year. Queen Victoria wasn't the only British icon who appreciated Patek Philippe. 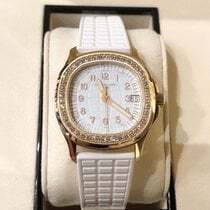 Two of her great-great-granddaughter's most prominent subjects, Beatles members Paul McCartney and Ringo Starr, have an affinity for these watches. They have each been Aquanaut owners for some time, though Rolex's Submariner may have been more fitting for the musicians responsible for "Yellow Submarine." The Dalai Lama wears a Patek Philippe chronograph gifted to him by President Franklin Delano Roosevelt, and actor Brad Pitt wears a Nautilus. Patek Philippe have always defined themselves by their excellence. In 1933, after three years of development and five years of manufacturing, the Henry Graves Supercomplication, an 18-karat gold timepiece, was finally completed. Banker Henry Graves Jr. had commissioned the watch in order to outdo the pocket watches commissioned by automaker James Ward Packard. Packard owned a dozen complicated Patek Philippe timepieces, which he had collected over the course of 25 years. Graves and Packard were two of the leading watch collectors of their time and had an ongoing rivalry that the Supercomplication ended. The watch is composed of 920 individual components and has 24 impressive complications. These include a perpetual calendar, Westminster Quarters, the sunrise and sunset time, and a view of the starry sky over New York City from Graves' Fifth Avenue apartment. In November 2014, the pocket watch sold for a record price of 24 million dollars at auction. Graves initially paid 60,000 CHF when he commissioned the watch, which is equal to about 200,000 USD today. The Supercomplication is the most complicated watch ever built without computer assistance. In 1989, Patek Philippe celebrated their 150th anniversary and unveiled the Calibre 89 pocket watch, which, with 1,728 individual pieces, is even more complicated than the Supercomplication. In November 2016, Patek Philippe broke another record: A watch with reference number 1518 sold at auction for 9.6 million Swiss francs. It was the highest price ever paid for a wristwatch. This precious timepiece is a stainless steel chronograph with a perpetual calendar.